A 10-µg Cf-252 spontaneous fission neutron source has been procured for use as a standard source for neutron dosimetry and for replacement of a depleted Cf-252. A radiation shielding container was designed and optimized using MCNP-5 radiation transport code to increase safety and versatility of transportation of the new source. Shielding materials considered for the model were acrylic, concrete, paraffin (plain and 5% borated), polyethylene, and water. The simulation results using F4 tally show that the use of borated paraffin resulted in the highest decrease in overall radiation dose rate. Using borated paraffin as the shielding material, a 3D dose rate mesh across the container was generated by FMESH4 tally. The overall design and the dose rate results show that the container can be used for both short distance transportation and temporary source storage. F. Hila, J. F. Jecong, C. A. Dingle, G. E. Lopez, K. M. Romallosa, and N. R. Guillermo. 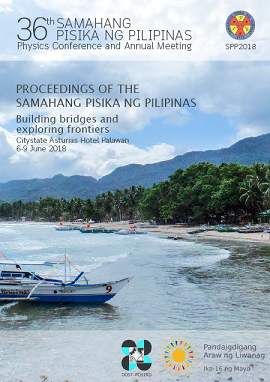 Design of a semiportable shielding for a Cf-252 neutron source using MCNP-5, Proceedings of the Samahang Pisika ng Pilipinas 36, SPP-2018-PC-07 (2018). URL: https://paperview.spp-online.org/proceedings/article/view/SPP-2018-PC-07.